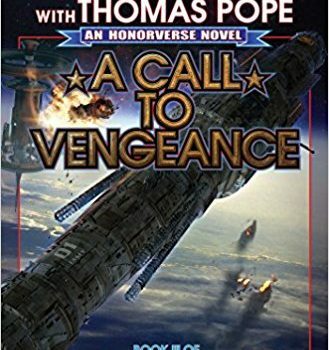 A Call to Vengeance, David Weber, Timothy Zahn & Thomas Pope (Baen 978-1476782102, $26.00, 480pp, hc) March 2018. 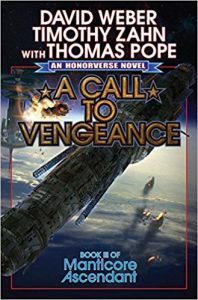 A Call to Vengeance by David Weber, Timothy Zahn & Thomas Pope is the third and latest novel in the Manticore Ascendant series, which began with A Call to Duty and continued in A Call to Arms. Set several hundred years prior to the events of Weber’s Honor Harrington novels, the series takes place at a time when the Star King­dom of Manticore has not yet become a significant naval or economic power in their region – when they’re a small state with a tiny, underfunded navy, before they discovered the wormhole that is a central part of Manticore’s economic and military concerns in the Honor Harrington books. 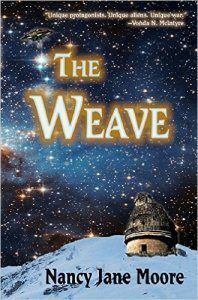 While the government of Manticore doesn’t know about the wormhole at this point, other actors do: representatives from the unscrupulous Axelrod corporation have been manoeuvring to take over Manticore by force for quite some time, and by working through proxies, they’ve success­fully kept their interest and their reasons secret. The government of Manticore is itself struggling to put in place the makings of a strong navy and the economic growth that would support such a thing, while contending with political factional­ism and personal empire-building among the elected opposition. A Call to Vengeance opens with Travis sum­moned to testify before a parliamentary inquiry. His ability to stick his foot in his mouth is cur­tailed, however, when an unknown hostile force arrives in the Manticore system. Recalled aboard ship, Travis finds himself in the middle of a tense standoff for Manticore’s future. But that’s only the first test. His superiors want to find out more about the threats facing Manticore, so Travis is transferred into a special intelligence service and, along with an old friend, given a special mission brief aboard a naval vessel showing the flag out­side Manticoran space. His captain is none too happy that her orders subordinate her judgement to a junior officer under certain circumstances…. Meanwhile, Lisa Donnelly is part of another Manticoran mission, this time to consult with Manticore’s allies in Havenite space, but this mission runs into a military confrontation with Axelrod’s pet pirate mercenaries. At home in Manticore, Elizabeth Winton watches her brother the king and his daughter die in a tragic accident, and succeeds unprepared to the throne – where she’s faced not only with threats to the security of her nation, but a potential constitutional crisis in the making, due to the constitutional provisions governing the monarch’s marriage and the lack of a clear heir should Elizabeth, too, die. This is a fun and entertaining space opera, re­freshingly lacking in the interminable technobab­ble and talking-head political exposition that has bedevilled Weber’s solo work in the last decade or so. It’s lively and offers an action-packed storyline involving space battles, espionage, and political manoeuvring. Its tension builds around questions of who knows what, and who is going to find what out when: a cunning set of nested dolls. And it’s very easy to read, with characters who’re largely appealing, albeit sketched in broad strokes. Unfortunately, A Call to Vengeance does suf­fer from at least one of the problems that have come to characterise the later Honor Harrington novels: the lack of a narrative arc that’s contained within one volume. A Call to Vengeance is the third book in a series, but it wraps up very few existing narrative threads from its predecessors. Nor does it have what one could consider a self-contained storyline itself. Instead, it feels a lot like a middle episode in a television show with a 22-episode season-long arc, revealing just enough – and moving along just enough – to keep the audience invested, without ever quite paying off in catharsis. There’s only so long a reader can put up with that sort of thing – but I’m a sucker for semi-decent space opera, so I’ll probably be reading the further adventures of Travis and company in the future, too.